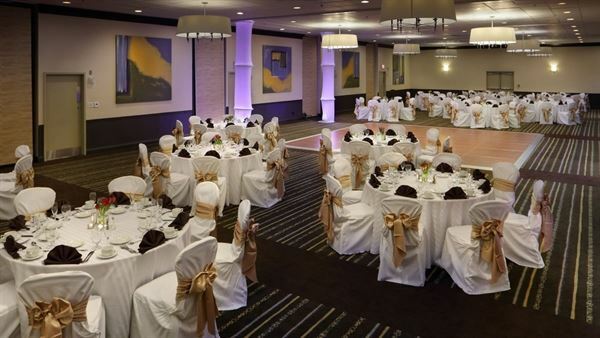 Whether it's a conference or social event in Boston, our hotel's facilities offer more than 9,500 sq ft. Plan an event in the 3,500 sq ft grand ballroom, the unique Jr. Ballroom or Metropolitan Square and take advantage of Free Parking. The Holiday Inn Hotel Boston-Bunker Hill, a Boston Quality Excellence Award Winner, is located just minutes from downtown Boston and 4 miles from Logan International Airport. We offer free wireless high-speed internet access in all guest rooms to help keep you connected and informed. The associates of the Holiday Inn Boston – Bunker Hill look forward to providing our award winning service! Each breakfast includes seasonal fresh cut fruit, orange, grapefruit and cranberry juices with coffee and tea service. Please select from the following options: • Simple start - $16 per person • Continental - $18 per person • Deluxe continental - $20 per person • Bostonian - $24 per person • Somerville - $28 per person • Executive - $32 per person Please review our attachment for more options. All prices are subject to sales tax, administrative fees and gratuity. Prices are subject to change. Plated luncheons include choice of soup or salad, rolls with butter, entrée, dessert, and coffee, decaffeinated coffee or hot tea. e. All lunches served with dessert and soft drinks. Starters - Select One Soup or Salad Minestrone Soup/ Soup du Jour/ Garden Salad/ Caesar Salad Please select from the following options: • Fresh berry salad with chicken - $28 per person • Chicken Caesar salad - $28 per person • Grilled sirloin - $34 per person • Pan-seared chicken breast - $30 per person • Grilled salmon- $34 per person • New England baked scallop - $33 per person Dessert - Select One White Chocolate Raspberry/ Cheesecake/ Flourless Chocolate Cake/ Key Lime Pie/ Turtle Cheesecake/ Carrot Cake with Caramel Drizzle Please review our attachment for more options. All prices are subject to sales tax, administrative fees and gratuity. Prices are subject to change. All menu pricing is per person, unless otherwise specified. All lunches served with assorted chilled soft drinks and bottled water. Please select from the following options: • Independence express - $29 per person • DIY Salad and sandwich creations - $32 per person • North end - $31 per person • Southwestern - $34 per person Please review our attachment for more options. All prices are subject to sales tax, administrative fees and gratuity. Prices are subject to change. All menu pricing is per person, unless otherwise specified. Buffets are displayed for 90 minutes. All buffets served with warm rolls, coffee and tea service. Please select from the following options: • Tuscany - $48 per person • The border - $46 per person • New England - $46 per person Please review our attachment for more options. All buffets served with warm rolls, coffee and tea service. The package includes: • Starters - Select Two Minestrone Soup/ New England Clam Chowder/ Creamy Roasted Tomato Bisque/ Garden Salad/ Caesar Salad/ Heirloom Potato Salad/ Penne Pasta Salad with Roasted Red Peppers Fresh Mozzarella, Tomatoes and Fresh Basil • Entrees – choice of two or three Grilled Chicken Piccata with Lemon Caper Sauce/ Lemon and Herb Crusted Cod Grilled Sirloin Steak with Merlot Jus Herb Crusted Salmon Maple Glazed Roasted Pork Loin Wrapped in Bacon Lemon, Rosemary and Garlic Roasted Chicken • Starch – choice of two Garlic Herb Roasted Potatoes/ Wild Mushroom Risotto/ Buttermilk Mashed Potatoes/ Wild Rice Pilaf • Fresh vegetable – choice of one Roasted Asparagus/ Roasted Root Vegetables/ Green Beans with Garlic Butter/ Glazed Carrots Steamed Broccoli Florets • Dessert – choice of two Key Lime Pie/ Turtle Cheesecake/ Flourless Chocolate Cake/ White Chocolate Raspberry/ Cheesecake Carrot Cake with Caramel Drizzle Please select from the following options: • 2 entrees - $48 per person • 3 entrees - $55 per person Please review our attachment for more options. This large private event space is perfect for social gatherings and meetings. This space is perfect for a meeting, cocktail reception, ceremony or dinner. Natural Light with tall windows - electronic black out shades for presentations.